Keeping the kids entertained over the Christmas holidays just takes a little forward planning. Of course, you probably won’t agree when they’re getting under your feet and arguing over the games console, but this at least may give you a few ideas to lessen the stress. The wonderful thing about Christmas with your children is that you can start traditions that they will remember forever. You don’t have to copy what your parents did (unless you want to) and it’s lovely to anticipate those special family rituals year after year. Cooking together in the run up to Christmas is a great way to get your kids involved with the preparation. If you make some little treats that you can wrap in pretty festive paper and give as gifts to appreciative relatives, so much the better! Try setting aside a day or two just before Christmas to make some edible gifts, such as cranberry and port sauce, mince pies, chocolate truffles and spiced nuts. Make sure you’re prepared with attractive sterilised jars, pretty boxes and plenty of ribbons. 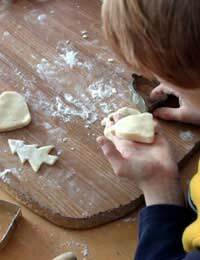 Not only will the children love making the treats with you, but their hard work will pay off when your relatives are given the home-made presents. Making decorations for the home is also a great way to get your children involved in the Christmas preparations. Either pick greenery from the garden or local park and then add in candles, ribbons and flowers to make pretty table settings or displays. Choose a colour theme together and your home will look individual and stylish for a fraction of the cost. This may not sound very festive, but it’s good for children to appreciate how much work goes into getting prepared for Christmas. This does not mean you have to wake your kids up to sweep chimneys and peel sprouts – after all, it is a special time for kids to relax and play with their toys from Father Christmas! Why not write a list of all the things you have to do before the big day and ask your children to put their name against a certain number of tasks. Younger children can certainly help with tidying away their toys and older children may perhaps set the table, wrap presents for relatives or prepare vegetables. As long as you don’t make the tasks seem like punishment, getting ready for Christmas as a family is a wonderful way to anticipate the big day. A few Christmas tunes can help while you’re working! There is no reason why you have to entertain your children every moment of the Christmas holidays. Many psychologists would agree that the most creative people have to allow themselves to be bored in order to come up with exciting ideas, such as music or novels, and children are no different. Rather than ‘hot house’ your children with planned activities and chores all the time, intersperse more organised days over the Christmas holidays with time for them to sit and watch Christmas films, play computer games or just daydream. These are the times they’ll be growing as people, not to mention coming up with their own creative ideas for games and stories that can become part of your family tradition.